When you travel, do you check your hotel room for bed bugs? You should really be doing this. Bed bugs are wonderful hitch hikers. They travel around the world in the luggage of unsuspecting people and they are extremely hard to get rid of once they are in your home. 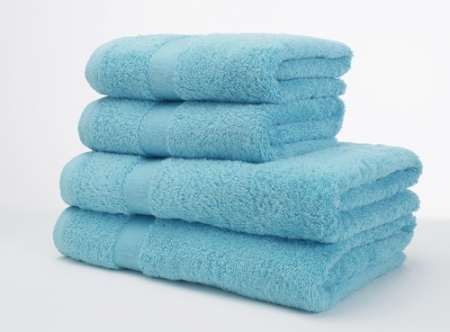 They require a high-heat treatment which can be costly and it may take multiple treatments before they are all gone. My co-worker recently went out of town for a training and he sent me this picture. 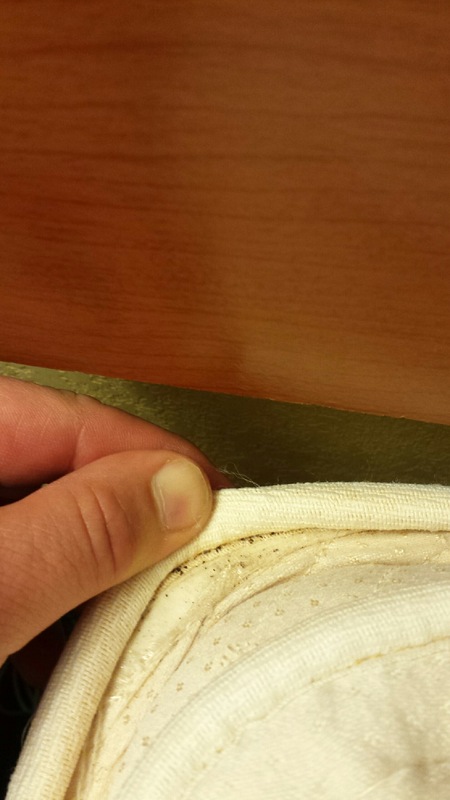 Yes, that is evidence of bed bugs in his hotel room. YUCK! So, how can you be sure you don’t bring them home with you: It’s really pretty simple. Whenever you are going to be staying in a hotel, hostel, dorm room – or anywhere else that’s not your house, check the bed. Check it before you ever bring your stuff in. If you cannot leave your luggage in your car, place it in the bathtub while you check the room. Go to the bed and pull back the covers. Pull the sheets away from the mattress near the head of the bed. Bed bugs like to hide in the mattress seams and under the pillow top. They are about the size and color of an apple seed. You may see the bugs or their sheds (double gross) or you may see brown spots on the mattress. Those brown spots are likely blood from the little guys being squished after a meal. If you find bedbugs in your hotel room, take your suitcase back out of the bathtub, go downstairs and notify the front desk. Ask for another room. Do not stay in that room. Your next room needs to be away from the original- Bed bugs can travel far enough to be in the rooms next door, the room above and the room below. One more thing: Bed bugs are not just a concern when traveling. It’s something to think about whenever purchasing furniture and other soft items for your home. Of course you should always look for them if you are buying used furniture, but also if you have had new furniture delivered. This is important because although the new furniture was most likely clean when it left the warehouse, it may have traveled on a trailer with haul-away furniture/mattresses. There is definitely risk for contamination there! Organic, Natural, Free-Range… What does it all mean? We see these things on labels in the grocery store. We read these terms in all the blogs that claim we should be eating a certain way… But what do these labels really mean? I admit that just one year ago, I didn’t know. I thought I knew, but I didn’t really know what exactly these terms meant for me as the consumer. I think that it’s important to know, so I am going to tell you. First, let’s talk chicken. We hear all the time about “free-range chicken.” What do you think of when you hear (or read) “free-range” or “free roaming” chicken? Before I actually knew what this term mean, I assumed that the chickens were free to roam around as they pleased, making them healthier, which in turn would make their meat better. For a chicken product to be labeled “free-range” or “free roaming,” the producer must prove to the USDA that the hens had some access to outside. That’s it. That could mean for an hour a day, it could mean that the chickens are in an outdoor cage. Then there is “Natural.” This just means that no artificial ingredient or coloring has been used and the chicken product is minimally processed. You might also see a label on your chicken product that says “No Hormones.” That’s great, but hormones are not used in any poultry production. It’s not allowed. So, putting this on the label is simply a marketing scheme to get you to choose one brand over another, and possibly pay more for it. I am not blasting chicken farms. I am simply letting you know that these labels do not guarantee a better product. They are often for marketing purposes. Now for pork. Sometimes you might see “crate free.” This means that the sow was not confined to a gestation crate when she had the babies. It doesn’t have anything to do with the actual consumer product, but may drive the price up some. What about beef an dairy? I have seen and heard a lot of misinformation regarding the beef and dairy industries. I have written a blog debunking the dairy myths. What about the completely confusing labeling? “Grass fed” means that the animal got 80% of it’s energy from grass or forage during its lifetime. It doesn’t mean that the animal was never fed grain. “Free range” beef means the animal was given unconfined access to pasture. The label “all natural” means pretty much nothing when it comes to beef and dairy. There are no regulations for using this on the label. The mother of all food labeling has got to be ORGANIC. If buying organic produce is important to you, be sure to look for the USDA Organic Seal, as this is the proof that the product comes from a farm that has actually been through the process of becoming certified and is being regulated by the National Organic Program. The NOP checks for pesticide residue, use of genetically modified organisms, and makes sure animals are being treated properly to be called organic. This seal means that the producer has been through all of the process to be certified organic by the USDA and that 95% of the ingredients in the product are organic. Please note that organic farmers do use pesticides. The amounts, types, and processes vary and are different from large-production farms BUT there may be pesticides used. If this is something that you are willing to pay up to twice as much money for, that’s your call. Just know that “organic” does not mean 100% pesticide free. You can find more on the USDA Organic Certification at their website. My suggestion is to buy as close to home as you can, when possible. That way you can have an actual conversation with the farmer about the product. I also strongly advise reading the labels with the knowledge of what the labels actually mean. Many of these logos and seals are simply there for marketing. Like the hormone-free label on chicken and poultry, where hormones are not being used by anyone in the US. I am not saying that you should or should not buy organic. I am not saying that GMO’s are bad or good or indifferent. I am saying it’s a confusing, tangled web of labels in my grocery store and I think it’s good to be informed! Thank you to Sarah Weeks, who taught me about food labels at an in-service training I went to about a year and a half ago. She is great! In my previous menu planning posts, I have had Mondays be “Slow-Cooker Mondays.” It has helped me to have a formula for my menu planning, but I don’t really like my slow-cooker for warmer weather. It seems that my go-to slow cooker meals are hearty and heavy and perfect for cold temperatures. SO… For the Spring and Summer months I am doing Salad Mondays. I will be featuring some really hearty salads on Mondays in my home. Last week I served Niçoise Salad and it was awesome. I put all of these things in a mason jar, put the lid on and shake. You could whisk them together in a bowl if you prefer to be more proper. Canned tuna or chicken- or any other protein you might like. Spring Break is behind us, but many women are probably still dreading thinking about getting into a swimsuit this summer. When we start feeling the warm air of spring and thinking about summer trips to the lake or pool, a lot of people start thinking about dieting. When I think about dieting, I immediately start thinking of all the foods and treats that I love, but shouldn’t eat. As soon as I mentally restrict myself, my cravings ramp up! It’s a mental thing that says “I want it because you told me I can’t have it.” It is really hard to overcome, and I would guess that it is also pretty common. I would guess that it’s common because diets don’t work. Why do diets not work? Because when we restrict our caloric intake, or when we go cold turkey on our favorite treats, we break and binge. I have a little tip that I think will help: Instead of focusing on the foods you can’t have, think about adding in the things that you need. Don’t tell yourself that cookies are the root of all evil and throw them all out. Just make yourself a promise that you will eat 5 servings of vegetables per day. The USDA currently recommends 3-5, so just go with the upper recommendation on this one. It will not be easy every day. In fact, some days will be difficult. But when you fill your body with good foods, you won’t be hungry. If you’re not hungry, your cravings will loosen their grip on you. I have pretty much zero willpower once I’ve been told (or told myself) that I can’t have something sweet. What I’m good at is waiting until a specified time. I won’t wait indefinitely, but if I tell myself “you can have that later tonight, after the kids are in bed,” I have no problem waiting until then. So, what I do is this: I set myself a small daily goal. It usually involves eating enough fruits and vegetables. I try to eat 4 veggies and 2 fruits each day. I also try to get 30 minutes of sweaty exercise a day. I call it sweaty exercise because everyone has their own fitness level, and everyone has their own favorite activities. Gardening is exercise, but it’s not sweaty exercise. Walking at a leisurely pace is not sweaty exercise, but running or walking at my own max of a brisk pace is sweaty exercise. I tell myself that if I reach my two goals and do not indulge in junk food during the day, I can have a nice piece of chocolate before bed. This method typically works for me. I am able to control myself and my cravings by adding in the good and waiting for my treat. Here’s the treat I like to have: I take a 12 ounce bar of good quality dark chocolate and I melt it in a double boiler. Then I chop up some dried cherries and pistachios, and mix them into the melted chocolate. I spread the chocolate mixture out on a cookie sheet lined with parchment paper and let it set up. Then I cut it into approximately 1 ounce pieces. It is so good! Putting a cup of plain white vinegar in the rinse cycle of your laundry can freshen and soften towels that have lost their fluff. Last spring I wrote about putting together an emergency kit. I had one last year, and then we never used it. We never had to take shelter from a tornado in 2014. As severe weather season is starting up again in the Great Plains, it is time to get last year’s kits out and restock them. I knew this last week. I knew that we had severe weather threats in the forecast. I got my kit out of our shelter. I saw the old snacks and the dead spiders, but I left it sitting in my laundry room until we had an actual tornado warning in Chandler, OK. We were watching the news as a tornado touched down in Moore, OK. Then our satellite signal was lost. Then the sirens went off. Of course, my hubby was giving the baby a bath when it happened. Isn’t that the way these things go? I took our 4 year old down into the shelter and told Zach we’d be there waiting. I grabbed up last year’s emergency kit and headed down with Amelia. A few minutes later Zach hands Sophie down to me, half dressed from her bath. So, what did I forget? Just about everything. We had a battery powered lantern. We had a radio that couldn’t find a signal. We had two cell phones with very little battery life. We had a couple bottles of water. We had no diapers, no snacks, and no blankets. How did I forget that these storms are caused by cold fronts hitting warm air? I’ve lived in Oklahoma my whole life. I know how tornadoes happen. Sophie’s little creeper outfit was only half on, and stayed only half on because I have not taken the time to clean out her drawers and remove the clothes that are too small. This is my shame. So, there we were, chilled and bored, and a little hungry. We also forgot to bring a bottle down for Sophie. Luckily, Amelia thought it was great fun to be down there. Luckily, the storm passed quickly and we were up on ground level within about half an hour, safe in our warm little house. We are expecting some severe weather sometime in the next three days. I actually got our kit stocked this morning in preparation. We have water. We have snacks. We have a blanket to sit on (hubby spilled motor oil on the floor). We have jackets. We have a change of clothes each. We have toys to play with. We have diapers and wipes. I will remember to make a bottle for Sophie as soon as I see the weathermen on tv. I encourage my readers (the few I have out there in Blogland) to put together a quick tornado kit. Do it BEFORE you are under sever weather threat. Do it today! You can read about it on my blog from last year. Remember the things you need may differ from the things I need. Think about who will be in your shelter with you, and what they would need if you were down there for a while or if you were not able to go back home. Medications, special foods, diapers, a special toy…. You may also want a whistle. If you are stuck for a while, it could get difficult to make a lot of noise for rescue crews to find you and a whistle will help. Think about what you might do with your pets. Just get it done! TODAY! This is us in our little shelter. It’s a horrible shade of blue. It’s like sitting in a blue, metal box. Well, it is sitting in a blue metal box.